"Sampath Speaking" - the thoughts of an Insurer from Thiruvallikkeni: when man enters animal enclosure - what can happen : 3 possibilities !! when man enters animal enclosure - what can happen : 3 possibilities !! It is a rare phenomenon of human relations with animals – in some zoos, the animal keepers become so friendly with the animals, that they respond to human language and calling by names !!! In life – sometimes there would be options ~ here are 3 different occurrences – all could have gone the same way !!! A couple of years ago, in a grisly incident, witnessed by scores and captured live on many cameras, a 200-kg tiger mauled and killed a youth after he fell into the animal's moat in the Delhi Zoo…… that gory incident went viral on social media, also raising the Q on why people who were keen on filming the incident did not respond in any manner trying to help the victim. The man in his 20s reportedly had either fallen off or had jumped into the moat which separated the tiger’s enclosure from the visitor’s gallery. The victim reportedly had history of mental illness – and it was described that authorities were in a state of helplessness. Miles away, in Chile, a man reportedly stripped naked, jumped in to lion enclosure, in a bid to feed himself to the big cat – a suicide attempt of a different order. The man, who has been named by local media as Franco Luis Ferrada Roman, was taken to a nearby hospital for treatment and was said to be in grave condition. The man survived but in the process, two animals, which did nothing wrong were killed. Authorities in Santiago confirmed that the two African lions were put down as they severely mauled the 20-year-old man who had broken into their cage early on Saturday. Zoo keepers killed two lions to save the man, who was gravely injured in the incident. A suicide note was reported to have been found in his clothing. It is reported that the young man broke into the enclosure, took off his clothes and jumped into the middle, horrifying other visitors who witnessed the attack. Once inside, the lions reportedly immediately pounced on him and began to 'play' with him. At this point, zookeepers intervened in the attack and shot the two lions in order to save his life. The director of the zoo, Alejandra Montalva, said: 'We believe that this person entered as a visitor and paid for his ticket. She told local media the park was crowded with visitors at the time of the incident. The zoo director said she was 'deeply affected' by the deaths of the two lions, a male and a female. 'The zoo has an established protocol because people's lives are very important to us,' said the director. She added that there were no fast-acting tranquilizers available to stop the lions from mauling the man. The attack occurred in full view of visitors, who could only watch in horror as the man was mauled and the lions - one male, one female - were killed. One witness, told Chilean radio station Bio Bio that the security personnel at the zoo were slow to react and that the animals did not attack the man as soon as he entered the enclosure. She also said the man was 'shouting things about Jesus'. Sadly, it was the animals which paid with their lives for the insane act of the man. Back home, it was the same African lion enclosure, slightly different incident, with a much different result. This time it was a drunken man’s misadventure into the enclosure of lions, in Hyderabad, seemingly to shake hands with a lioness. 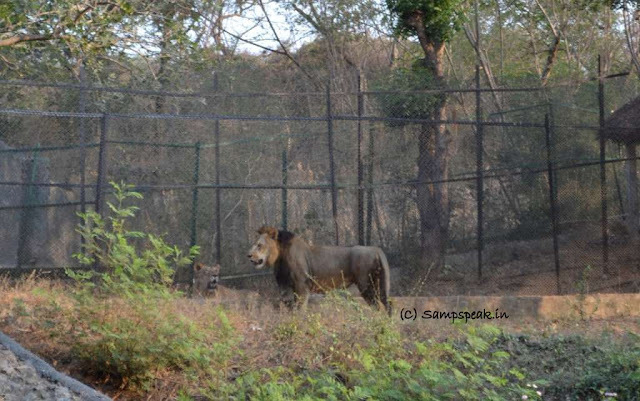 At Nehru Zoological Park in Hyderabad, the alertness of the zoo animal keepers, prevented the loss of life. 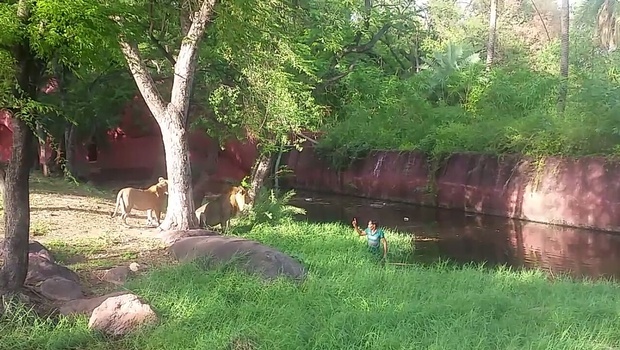 Indian Express reports that it was around 4.55 pm when 35-year-old Mukesh Kumar jumped into the moat, ignoring the warnings of onlookers, calling the lioness 'darling'. As he splashed into the water, the lioness Radhika moved towards him. Soon her partner, lion Krishna too started approaching the intruder. Mukesh, however, was not the one to fear. In a fully inebriated state, Mukesh extended his hand towards the wild animals. As the onlookers screamed in panic and started throwing whatever they could at the lions to ward them away from Mukesh, the animal keepers rushed to the spot. Animal keeper R Papaiah called Radhika, the lioness, to move aside even as Mukesh kept extending his arm to her. To the luck of Mukesh Kumar, native of Rajasthan, Papaiah, who has been taking care of the two wild cats for the last seven years, also intervened calling the two to step back. The animal keepers managed to divert the attention of the wildcats, while Mukesh, after much pleading, was rescued from the jaws of death without a scratch and then handed over to the police. Mukesh Kumar, hailing from Kurdiya in Sikar district is a labourer working with metro rail project. Kumar reached the zoo along with five of his co-workers after gulping down a few pegs in the afternoon. Zoo curator Shivani Dogra, who took charge only a day before, appealed to the visitors to follow rules to ensure their safety. Donald Trump's plans ! - Tamil Nadu Elections !! Interesting IPL - KKR beats RCB - drops !! hiring Alpacas for marriage .. ! !